Looking for a unique gift for an art enthusiast or for yourself? 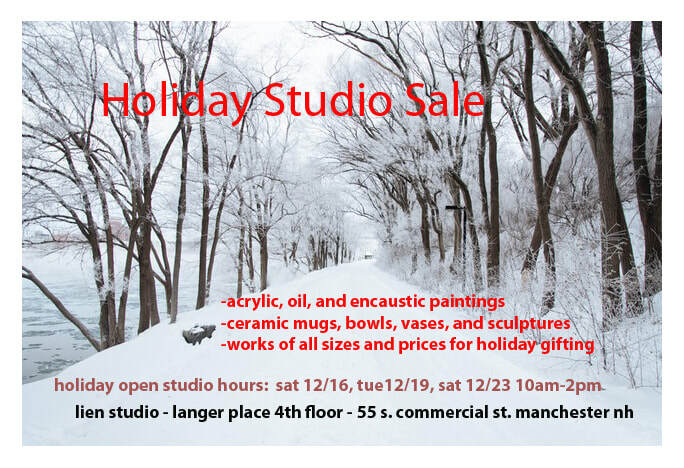 Lien Studio will be open for any last minute gifting needs with a Holiday Studio Sale 3 days this week. Works of all sizes and prices for holiday gifting will be available--paintings in acrylic, oil, and encaustic and ceramic mugs, tumblers, bowls, vases, and sculptures. Small to mid-size paintings are 25% off during the holiday studio sale. Additional discounts on older/experimental work will also be available. Located right off 293 exit 5 on South Commercial Street just before the Delta Dental Stadium. Free parking in Langer Place parking lot for guests. Enter through the back of the building for an elevator to the 4th floor or 2 flights of stairs through the front entrance.